Youki Bessho was born in Osaka, Japan. She spent her childhood in Europe. She graduated from ‘Kobe College’ with the top honour and was awarded the “Hanna Gulick Suehiro Prize” and the “Club Fantasy Prize”. She won several competitions in Japan such as ‘Japan Student Music Competition’ in Osaka, ‘Japan player’s competition’ in Tokyo etc. Youki again moved to Belgium to study in the Royal Conservatory of Brussels as a scholarship student of French Community of Belgium with professors Vanden Eynden and Michel Scohy where she was awarded a Master degree in music with highest honours. She got scholarships from many organizations and foundations (‘Nasu sisters Foundation’ of Kobe College, ‘the Chopin Foundation’ in Belgium, etc). 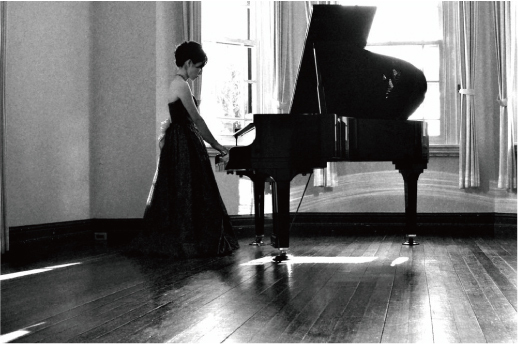 She won several competitions in Europe; such as the second prize in ‘Newport International Competition for Young Pianists’ (the United Kingdom) with the special award from judges and also the second prize in ‘Concours International André Dumortier’ (Belgium). In 2011, she played the 1st concerto of Liszt under the conduction of Yuzo Toyama in the Izumi Concert Hall (Osaka) and ‘Rhapsody in Blue’ of Gershwin under the conduction of David Miller in the Concert Hall of the Conservatoire Royal de Bruxelles (Belgium). Youki now lives in Japan where she continues performing, along with teaching at the Kyoto Seibo College. Youki Bessho est née à Osaka, au Japon. Son parcours est marqué par plusieurs séjours en Europe, où elle a résidé plusieurs années. Diplômée de l’université " Kobe College " (Japon), dont elle sort première avec les prix "Hanna Gulick Suehiro" et "Club Fantasy", elle s’illustre dans différents concours japonais, dont le "Japan Student Music Competition" à Osaka , et le "Japan player's competition" à Tokyo. Youki s'installe ensuite à Bruxelles en tant que boursière de la Communauté française de Belgique, pour y continuer ses études au Conservatoire Royal où elle retrouve Jean-Claude Vanden Eynden et Michel Scohy. Elle y décroche un Master en musique avec la plus grande distinction.Elle obtient des bourses de plusieurs organismes et fondations (dont la Fondation Chopin et la Nasu Sisters Foundation).En parallèle, elle sera lauréate de concours européens, dont le "Newport International Competition for Young Pianists" (Royaume-Uni) avec prix spécial du jury, et le concours André Dumortier (Belgique). Depuis 2010, Youki poursuit ses activités musicales au Japon où elle réside actuellement. En 2011 elle interprète le 1er concerto de Liszt sous la direction de Yuzo Toyama à la salle ‘Izumi Hall’ à Osaka, et ‘Rhapsody in Blue’ de Gershwin sous la direction de David Miller à la salle de concert du Conservatoire Royal de Bruxelles. Elle enseigne aujourd’hui au Kyoto Seibo College (Japon). Copyright © 2011 bessho youki, All rights reserved. webDesign & Photographer:OKEYA INC.